In a sincere effort to continue to offer our customers the highest quality products at the most reasonable prices, Omega will strictly enforce our stated & printed warranty policy on all products. Omega has and will continue to warranty any manufacturer's defect; but "wear & tear" is not considered a Manufacturer's defect and therefore is not covered by our replacement warranty policy. Please review the warranty policy printed on the manuals that accompany our products. Due to the fragile nature of any device with an LCD screen and its vulnerability to "Wear & Tear” damage, Omega will examine every 2-way controller that is returned in order to determine the cause of the failure. If it is determined that the cause is "Physical Damage"(scratches, chipping or other wear & tear), the controller will be returned with a tag stating "Out of Warranty". If the cause is a legitimate manufacturer's defect, then the controller will be promptly replaced. 1. The LCD on the 2-way controllers are vulnerable to impact damage. Especially when dropped or pressed down upon. They are also vulnerable to water damage, etc. Please encourage users to treat these with care. 2. If the controller's case is scratched, worn, chipped, or shows other signs of abuse, i.e. “normal wear”, they will not be covered by Omega replacement warranty. In the case your 2-way controller is not covered by replacement warranty, Omega has available stock of replacement cases and new controllers for purchase, as well as re-manufactured controllers at reduced cost. Contact your Omega sales representative for more details. 1. The customer will pay all domestic shipping to Omega Research and Development. 2. Omega Research and Development will pay domestic UPS Ground and U.S. Mail shipping to the customer. When there is a request for premium shipping, the customer will be charged the difference between the UPS Ground shipping cost and the premium shipping cost. 1. Physical damage is not covered under the Omega Research and Development warranty program. 2. All warranty returns will be repaired or replaced at Omega Research and Development's discretion. 3. Each return should be accompanied with a itemized packing list with an explanation for each item from the customer. When a discrepancy is discovered, Omega Research and Development will call the customer to verify the findings as long as a phone number is provided. 4. The customer may request special handling or give special instructions for a return by clarifying them on the packing list. 7. The customer may request that the return be repackaged with all components to a like new condition when all parts are available. The customer will be charged for all needed components. 8. 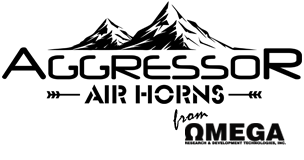 In the event that Omega Research and Development is unable to repair or replace the return, an equivalent model will be substituted, at Omega Research and Development's discretion, at no charge to the customer within the warranty period. 1. Omega Research and Development will supply (when available) electronic components on an as needed basis so export customers may repair product. 2. International shipping will be paid by the customer in both directions. 1. Omega R&D will supply all of the necessary repair & replacement parts (i.e. solenoid valve, pressure switch, etc.) needed to maintain and repair Omega branded air horns & air-compressors. 2. Due to the extreme nature and location of air horn installation, Omega will not accept horn/compressor returns for warranty exchange unless the carton is unopened and horn/compressor is unused. 3. General abuse such as Mud, Dirty Water, Dinged, Dented, Bent and/or broken horn trumpets and compressor tanks are not covered under Manufacturer's warranty. 4. Installer must take care when mounting horn/compressors to avoid structural damage to the units. Choosing a protected location which shields horn / compressor from water, mud, debris, drive shafts & axles is strongly recommended. *User must regularly clean the air compressor to ensure its longevity. 1. Due to the wear & tear nature of ”STROBE LIGHT BULBS”, Omega will not accept Bulbs for warranty exchange unless the bulbs were “dead out of the box”. Replacement Strobe bulbs are available for purchase. 2. Omega will only accept BALLASTS for warranty exchange for a period of 90 days. Omega warrants, to the original consumer purchaser, the Omega Telematics unit to be free from defects in material and workmanship for a period of one (1) year from the original date of installation/activation of the Product, provided the original installation was performed by an authorized dealer. As your sole remedy for a defect, Omega will repair or replace, at its option and free of charge during the warranty period, any system component that proves defective in material or workmanship under proper installation, use, and service, provided the Product is returned to the dealer from which it was purchased. Products returned to the dealer must be accompanied by a photocopy of the purchasing information (original receipt w/ date & pricing). Any damage to the Product(s) as a result of misuse, abuse, neglect, accident, incorrect wiring, improper installation, destruction or alteration of the serial number, unauthorized or improper repair or alteration, including but not limited to repairs or alterations made by anyone other than the dealer, or any use volatile of instructions furnished by us in the Acceptable Use Policy will void the warranty. This warranty is limited to defective parts and specifically excludes any incidental or consequential damages connected therewith. Omega makes no warranty against theft or otherwise. This warranty is not to be construed as an insurance policy against loss. Warranty on installation labor, removal and reinstallation charges are not the responsibility of Omega unless performed by Omega. Omega GPS service works using cellular or other wireless phone networks in the United States, Puerto Rico, Canada and Mexico. ALL Omega Telematics SERVICES ARE NOT AVAILABLE EVERYWHERE, PARTICULARLY IN REMOTE AREAS, OR AT ALL TIMES. Omega Telematics service cannot work unless your vehicle is in a place where we have an agreement with a wireless service provider for service in that area. Omega Telematics service also can't work unless you're in a place where the wireless service provider we've hired for that area has coverage, network capacity, and reception when the service is needed, and technology that's compatible with the Omega Telematics service. YOUR CAR HAS TO HAVE ADEQUATE BATTERY POWER FOR THE Omega Telematics PRODUCT TO OPERATE. Omega Telematics service may not work if your Omega Telematics Product isn't properly installed (by someone we've authorized) or you haven't maintained it and your vehicle in good working order and in compliance with all government regulations. *This warranty policy is subject to change at any time without notice.